Today is the third part of our Dream Job series and we’re meeting Tracey aka Mrs Bouquet who loves all things flowers and floristry. 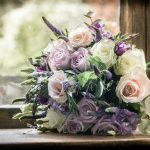 Here’s the green fingered lady to tell us more…..
How did you become a Wedding Florist? After working in London for 17 years, my kids arrived and I wanted a job I could fit around them. I always loved working in the garden and had one of those ‘light bulb’ moments! I enrolled in Hadlow College, which was amazing – it’s full of great teachers with great energy, knowledge and a passion for the craft. After four years of training I was ready to start out myself. As a keen gardener I’m always inspired by garden flowers. The UK is fantastic for flowers as we have the changing seasons. My style is influenced by these factors and has an English Country Vintage vibe. I really love to push the boundries with flowers and colour to create beautiful bouquets and displays. Passion, creativity and colour confidence! You also need to be organised and work well under pressure. And don’t be scared to do something different – you usually produce your best work when you’re taken out of your comfort zone! The best part is working with my clients to produce bespoke designs for them. I find the whole process really exciting, from the first consultation to the Wedding Day, it’s great to look back and see how everything has come together. 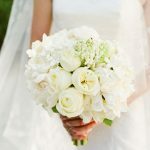 I also love giving the Bride her bouquet – it’s that mix of being nervous and excited at the same time. The worst part is working in freezing conditions! Your workshop has to be cold so the flowers are kept at their optimum condition, but it does mean you end up pretty cold yourself! What’s the three things most couple’s ask first? Usually what flowers are available around their Wedding Day. I always make lots of recommendations on availability and then go through what they like and what they don’t like. The next is about visualising their flowers. It can be difficult to imagine what your flowers will look like on your Wedding Day so generally I create a mood board for my couples. The next is Colour. Most Brides pick just two colours but three can work so much better. Top tips for making the “Big Day” run smoothly? Remember to be flexible with flower choices and go with what’s in season as they are generally the best option and better value for money. Flowers are a natural product and not always available when needed so have an alternative option ready. Also don’t drive yourself nuts trying to get exact colour matches! The more shades you have the more natural and better it will look! 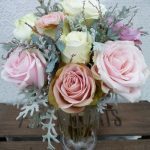 What would be your advice to aspiring florists? The hardest part of running a business is getting yourself out there. Keep networking, go to Wedding Fairs and ‘show off’ your work. You’ll start to be recommended and your business will take off. Be patient, it will happen! I can’t remember how many times I wanted to give it all up but I’m so glad I didn’t as I love what I do. What’s been your best moment as a wedding Florist? It’s always when I give a Bride her bouquet and they are so happy they burst into tears. It happens a lot and I usually end up crying too! Thanks to Mrs B for answering all our questions and if you want to know more pop over and say hello – she’ll be pleased to see you!